Are you tired of struggling with your weight and your finances? While my weight has always been a concern for me, I rarely think of my finances as one, since I took charge of them years ago. Now that I am getting ready to get out of most of my credit card debt, I am looking for more books to help be more financially sound. When I was asked to read Lean Body Fat Wallet – a new book that combines finances and weight loss, I was pretty excited! Looking for a way to lose weight and gain control of your finesses? Ellie Kay and Danna Demetre, two life experts, come together to bring you Lean Body Fat Wallet, a book to help you transform your life and make you feel more physically and financially fit. Their central idea in this book is that many of the tips for keeping you healthy also lead to healthy finances, allowing you to breathe easier and lose weight. This book is designed to literally help you gain control of your life again. You may just be surprised at how feasible it is is to do both! I will freely admit, this was not one of my favorite books. I had a really hard time reading this book since it seems to jump around quite a bit. The two authors write together in 3rd person, but there really isn’t a clear break when they switch, making things confusing and rather jarring when you are left trying to keep up with the topic of the chapter. More than once, I felt like the same things were being stressed over and over, and the advice itself seemed to me to be largely common sense. I personally felt like the book would have been great if it was written as two separate books, or perhaps just more clearly divided, but as one, everything felt jumbled, hard to read, and (unfortunately) a bit boring. While there is some great advice, it is more of a good read for the motivational stories about their clients and themselves. Overall, I was a bit disappointed in this book since I was really looking forward to reading it. Based on my own opinion, I give Lean Body Fat Wallet a C rating since the information and science is still sound – I just did not find it as helpful for me as I hoped. Would you like to read this book yourself? 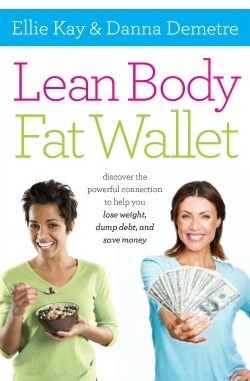 You can purchase Lean Body Fat Wallet on Amazon.com for $12.41 for the paperback and $9.99 for the Kindle copy. I'm so glad I read this review! I've been debating requesting this book from a blogger program, but I've been on the fence. I think I'll go for a different one instead because I think the same things that bothered you would bother me.